Center for Spiritual Living, Reno has several homegrown groups comprised of people who share a similar interest and passion. Women’s Spirit is open to women of all ages. We join together once a month and enjoy fellowship with delicious snacks, sacred community through inspired activities that promote values based living and divine connection. We have several affinity groups within the larger Women’s Spirit group that can be joined at any time. While we have several Affinity groups, it is not necessary to join a group to be part of Women's Spirit and enjoy our monthly meeting spiritual activities. The topic for the month of April at Women's Spirit is The Kingdoms of Consciousness - what they are and how they can inform and support us on our spiritual journey. The topic for the month of May: Join several of our beloved practitioners as they uncover the mysteries of a practitioner session and guide you in an experiential to explore the Wisdom held in past experiences that inform your present reality. Beginning Feb. 23rd, will begin a new book - Real Love and Dating. If you are interested contact Jacquelyn or Dale Baldwin @ massagebyjacq@aol.com. • Knitting Group meets the 4th Tuesday of every month at The Yarn Refuge on Lakeside Ct. @ 12:00 noon. All levels welcome. Led by Tica Sances. Bring your projects and supplies with you for fun and fellowship while you knit away. Next meeting April 23rd. • Community Outreach Group - sponsors various Community Drives for local organizations. We support The Eddy House and Domestic Violence Resource Center on a monthly rotating basis providing items they need. We would love for you to join us! We are always looking for new ideas and ways we can serve our community, celebrate life and grow together in Spirit. Please feel free to contact Laura Arneson, RScP @ womensspirit@cslreno.org or 775-420-8615. Men’s Spirit is a community of men praying, learning, serving and in fellowship with and for each other. Getting together for nearly 10 years, these are men of all ages and interests are committed to their own spirituality, to their mutual friendships, and to supporting our Spiritual Community. The men of Men’s Spirit are invited to join and participate in “SOMg’s”—which is an acronym for Spirit of Men Groups in the Science of Mind that is similar to Sangha—a Sanskrit word in the Buddhist tradition meaning a spiritual community of friends who share a common purpose and pray for one another, with the intention building community, providing a safe place for men to grow, pray and serve together. 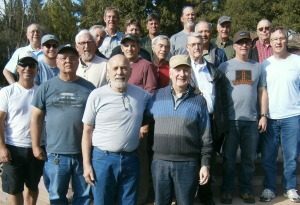 Men's Spirit meets the third Saturday of each month at 8 a.m. in the Youth and Education Center of CSL Reno for a potluck breakfast, fellowship and spiritual growth. All men are welcome! The Young Adults of Center for Spiritual Living, Reno (ages 18 through “30 Something”) get together to connect, have fun, find common interests and develop a spiritual bond. Male or female, single or married, kids or no kids, straight or gay—this is a loving and welcoming group of friends. If you'd like to be involved, please contact Rev. Steve Yarborough at RevSteveY@gmail.com.